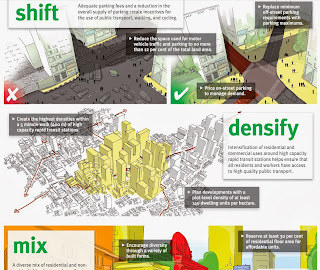 How much parking should be required in a Transit-Oriented Development (TOD) zone? And is there a formula related to density or other parameters? These were questions from Mumbai in India a couple of weeks ago, via email and on the Shoupista facebook group. Zero is the answer I prefer. Regular readers will know that I tend to argue for zero parking requirements EVERYWHERE, not just in transit-rich locations. And remember, a zero parking minimum is not a war on cars and does not necessarily mean there will be zero parking. But YOUR answer to this TOD parking question will depend on your approach (or the approach that you have to work with wherever you are). So let's discuss the possibilities, paying special attention to the mindsets on parking behind each approach. The 'conventional suburban' approach to parking fears parking spillover more than it fears excessive parking supply. 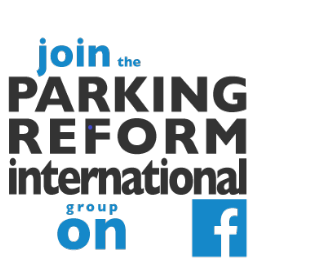 It sets parking minimums based on peak parking demand at isolated, suburban sites. The result is very high parking requirements. When applied without exception across the landscape these are a bane of TOD efforts. So one obvious tweak for Transit Oriented Development zones is to 'Right Size' the parking standards to better match the actual (lower) demand that can be expected in such locations. Notice something about the mindset here? This adjustment to parking minimums doesn't question the key assumption of the conventional approach. 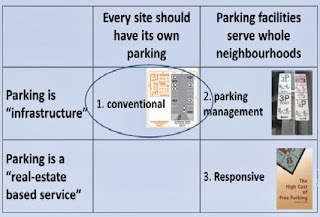 Every site is still expected to have 'enough' parking. So this is an approach to TOD zone parking that remains firmly within the conventional parking policy mindset. This approach requires parking demand investigations for various contexts, including TOD zones. 1) A study at UC Davis (led by Dr. Susan Handy) for the California Department of Transportation to develop an adjustment equation for sites in "smart-growth" areas. A user-friendly Excel spreadsheet tool is available from the website. 2) A study at Portland State University (led by Dr. Kelly Clifton) developed a method to account for differences in trip generation across a range of urban contexts using Portland metropolitan area data. Do you know of similar efforts elsewhere? Does your city adjust its parking standards to suit TODs? Something like this seems also to be common in Europe (outside inner-city areas), although with much lower parking demand (and therefore minimums) than in the USA. Examples include Zurich (mentioned in ITDP's European U-Turn report) and Munich. Again, please notice that this approach to TOD parking is conservative. It is still in the "conventional" box in the matrix of parking mindsets shown above. It doesn't try to force any change in demand, or even to encourage parking pricing or unbundling. It just tries to avoid forcing too much parking. 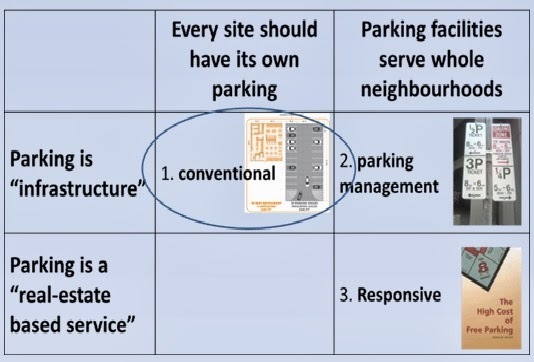 So what are the approaches to parking in TOD zones if you have a Parking Management mindset or a Responsive parking mindset?